10/16/2003 - OSHA-recognized chemicals as carcinogens or potential carcinogens for Hazard Communication purposes. Title: 10/16/2003 - OSHA-recognized chemicals as carcinogens or potential carcinogens for Hazard Communication purposes. Thank you for your June 25 letter to the Occupational Safety and Health Administration's (OSHA's) Directorate of Enforcement Programs. You have a question regarding one of the provisions set forth in 29 CFR 1910.1200(d)(4), OSHA's Hazard Communication Standard. This letter constitutes OSHA's interpretation only of the requirements discussed and may not be applicable to any question not delineated within your original correspondence. Our reply to your paraphrased question is provided below. Question: Please clarify 29 CFR 1910.1200(d)(4)(iii) which relates that chemical manufacturers, importers, and employers evaluating chemicals shall treat 29 CFR Part 1910, Subpart Z, Toxic and Hazardous Substances, as one source establishing that a chemical is a carcinogen or potential carcinogen for hazard communication purposes. Are the Tables Z-1, Z-2, and Z-3 intended to be lists of chemicals that OSHA recognizes as carcinogens or potential carcinogens for hazard communication purposes? Employees have a legal Right To Know about the hazards of the chemicals they work with. 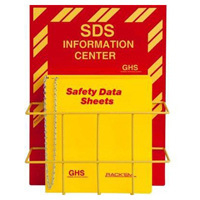 Ensure regulatory compliance with this handsome center from Safety Emporium. In addition, in your letter, you stated, "Pursuant to 29 CFR 1910.1200, chemical manufacturers are obligated to list a product as containing a carcinogenic substance if a constituent element makes up more than 0.8 percent of the product…" Please be advised that 1910.1200(d)(5)(ii) requires that a mixture, "shall be assumed to present a carcinogenic hazard if it contains a component in concentrations of 0.1 percent or greater, which is considered to be a carcinogenic under (d)(4) of this section."